Eau Claire is home to wonderful condominium buildings and The Point On The Bow is one of its best. This premier, high-rise condominium building is a glass palace overlooking the river in true majesty. Since its inception in 1999, The Point On The Bow has become a landmark in Calgary and offers a truly urban lifestyle that is both comfortable and luxurious. The building's prestigious address is 837 2nd Avenue SW, Calgary Alberta, T2P 0E6. The Point On The Bow offers a wide array of functional floor plans, known for the monolithic glass walls that accentuate the condominium's beauty. 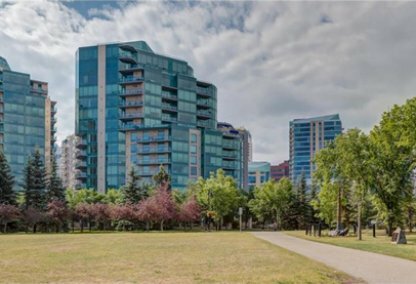 Explore the following Point On The Bow condo listings to find your dream home now or learn more about life in this stunning building. The Point On The Bow is a 15-storey building which houses 38 living units. The suites in the Point On The Bow are spacious and feature the impressive walls of windows that the building is recognized for. These glass panes provide residents of The Point with fantastic views of the city, Bow River and the areas beyond. The exterior of the building is equally beautiful, comprised of concrete construction with tyndal stone. 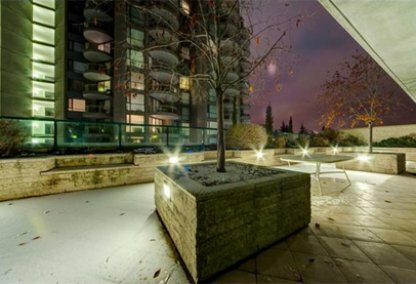 A large glazed canopy shelter shields residents at the drop off and pick up laneway, and professional concierge services are offered 24/7 to assist condo owners. The lobby is spectacular with a 21 foot high entry area, and is decorated with extensive tropical plants, a stone bridge, granite waterfall and a trickle fountain. The waiting room is lavishly furnished and quite comfortable as well, welcoming residents and guests in style. No expense is spared in providing phenomenal condo living. The Point Park Library, complete with a fireplace, and a large social room are some of the most attractive features in the building. The Point On The Bow also has its own steam room, exercise room with a TV and an indoor pool, with shower rooms and supplied towels. Residents enjoy access to gardens and rooftop patios as well. The Point On The Bow’s luxury condo suites are supplied with soft water and all the units are fitted with an interior heat pump and ductwork. Residents have keyless card-controlled entry and ample heated underground parking with wide spacing. For additional comfort, air conditioning is offered in all the suites. The nearby Eau Claire Market provides an array of fresh groceries, while The Point On The Bow's location on the south bank of Bow River ensures an abundance of recreational amenities. The Point On The Bow condos provide an unparalleled lifestyle of luxury, comfort and ease in the desirable Eau Claire neighbourhood. 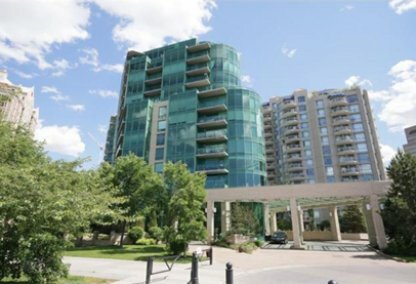 Justin Havre & Associates can introduce you to Point On The Bow condos for sale & connect you with other luxurious real estate opportunities in Calgary. Call 403.217.0003 or contact us online to get started.